I was given the image below which I painted in GIMP. Those of you who have been following me know I don't have any girls, so I thought it would be fun to give the girls each a dress that looked like it was made from matching Calico Fabric. I used a background that I created with an Image from the Graphic fairy and used it for all three girls dresses as well as the little doll laying on the floor. I used two Graphic Fairy images, one for the picture on the wall (bluebirds) and the rose that is in the center of the plate (it is the same one I used for the dress pattern that I created). I used some different brushes in Gimp (also available in photo shop) to create my pattern on the couch and floor (hard to see that one). I printed out my image, distressed the edges with my scissors, then inked them with Ranger's Vintage Photo. I place this on top of a piece of Graphic 45 paper that I measured out to be 1/2 inch larger than my image. I used one of my favorite Spellbinder dies with a piece of the London Market papers from Pink Paislee. My favorite Champagne flatback pearls from Pro 31 Designs adorn the edges of my card. I used individual pink flatback pearls as well as someiridecent crystal bling trim to dress up my Rectangle die cut. I place this piece with dimensional pop dots onto a dark red scrap of patterned scrapbook paper. The Ivory Mulberry Rose is also from Pro 31 Designs. The vintage seam binding is some I won from the Really Reasonable Ribbon challenge blog. The ivory crochet flower is from my stash, I just added the champagne pearl center. One final look at the card. Get going on your Shabby Chic or Vintage themed creations and don't forget to add some "Vintage Children" to play along with us at Sugar Creek Hollow this week! This week we want to see you add CIRCLES to your Vintage, Shabby Chic or Primitive style creations. So it is simple, we just need to see some circles on your creation! Here is my piece for this week. For my circles on the front of my card, I used the Nestablitities "Lacey Circles." The round die cut that is stamped "A gift for you" I won a while back from Just Rite Stamps (it is actually a round tag, I just cut off the tab at the top). My papers are from the Pink Paislee "London Market Collection." I distressed some of my edges and did my inking of all piece with Ranger's Old Paper distress ink, and my stamping with Vintage Photo. 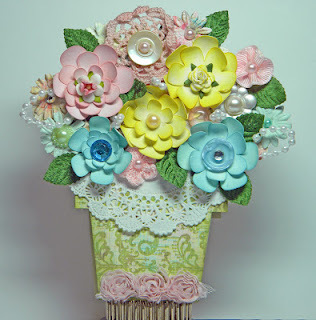 I used some of my favorite embellishments from Pro 31 Designs. Pink flat back pearls line the outside of my card, while Champagne pearls line the inner square. I also used the Ivory drop beaded trim around my center round die cut. I love the Pink and Ivory mulberry roses! Didn't you know..pearls are like circles :0). Gotta love the green and ivory leaves, I just love that trim. I rarely use it as a whole piece, I tend to cut the leaves off individually all the time..LOL. I have some gorgeous round clear crystal trim, and it catches the light just beautifully!! More of the ivory drop beaded trim graces the bottom of my card. I just love all the embellishments :0). We also have a tutorial this week from Renee: Shiny metal to rusty metal. Vintage, Shabby Chic or Primitive projects. Here is my inspiration piece below. I used some fabulous Glitz patterned paper and Images from Gecko Galz. You know I LOVE EMBELLISHMENTS!! The Vintage white frame, is from the Frames Collection by Gecko Galz. 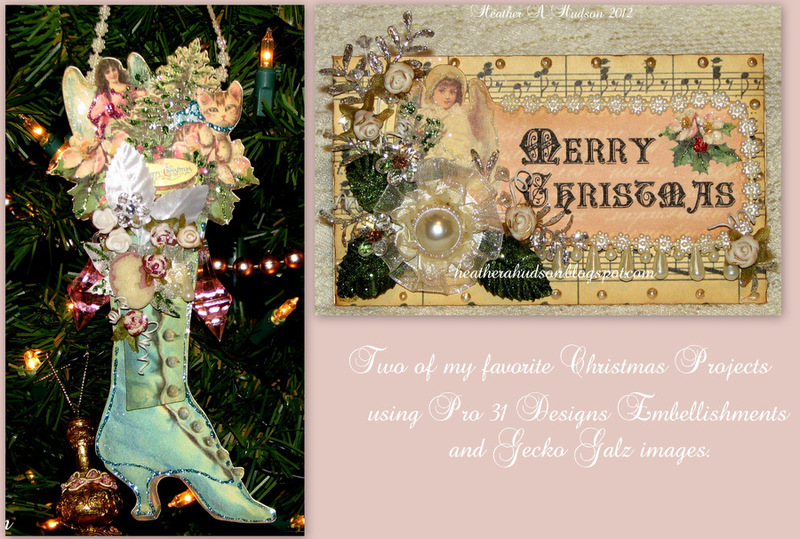 The Two vintage ladies image is from the monthly free digital collage sheets I receive with the Gecko Galz Newsletter. You can sign up at Gecko Galz (under the bathing beauty on the left of your screen). I used inkscape to create the die cut frame and a offset shadow of it with my digital cutter....black cat cougar. Here is a great look at the clear acrylic wheat sprays, pink mulberry roses and porcelain roses. I used some pink flat back pearls around the card background and frame. I also used some of my favorite champagne flat back pearls for centers of my antique buttons. Look at the Gorgeous Ivory felt like leaves, and ivory drop bead garland!! Yummy!! I added a few embellishments to it too, but kept it pretty flat so that it would slide in behind the vintage frame with out many problems. I just LOVE this image from Gecko Galz!! I used some of the fabby pink flat back pearls! The Aqua seam binding is from Really Reasonable Ribbon. Here is the back of the tag. I inked all the edges of my card tag, and die cuts with Ranger's Old Paper. So what are you waiting for? I know you have lots of embellishments laying around. So why not add them to a fabulously vintage, shabby chic or primitive creation and come play along with us at Sugar Creek Hollow. We ask that you find some paper, and make it your own. Stamp it, paint it, emboss it, alter it and use at least one piece of it your project this week. I hope you will find some time to make a card, tag, altered piece etc...in the Shabby Chic, Vintage or Primitive style and play along with us! GIMP tutorials. Once you learn the basics, you can take that information and create your own papers. Here is my Easel Card below. I used some of my favorite colors to create a Birthday Card for one of my best painting friends Marybeth. I distressed the edges of all my pieces and inked them with Vintage Photo Distress Ink, by Ranger. I used some GLITZ paper for the base of my card. It was pink and white striped, and I added some vintage photo polka dots (I LOVE polka dots). Here you will see some more of my fave Champagne pearls, pink rosettes, ivory mulberry roses and May arts leaf trim. As well as a button and some flower shaped beaded trim. The light blue piece is a smaller spellbinders die. Polly's Paper Studio. I just inked the edges and added some polka dots. Pink and brown is one of my favorite color combos!! Here it is in "display mode"
It is all beautiful and vintagey!! I hope she likes it. (I know she will, she loves all my stuff...lol). I hope that you have some time to create your own designer paper in a Vintage, Shabby Chic or Primitive Style, and play with us this week at Sugar Creek Hollow! She earned her G.D. Spot with the beautiful card below. Don't you just LOVE it!! You could be one of our Guest Designers...so come and play!! (just click on the photo to go to her blog post about this beauty). I really appreciate all the lovely comments you leave!! Super short post this evening!! for all the lovely comments you left for me on my blog hop post! 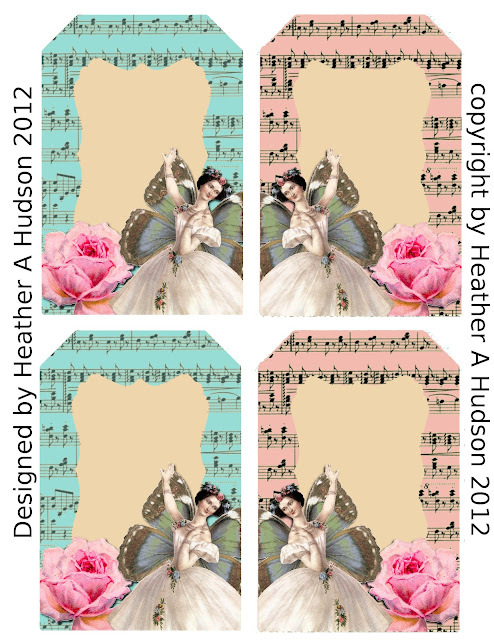 I so appreciate all the kind words regarding the collage sheets I created to share! Please send me a message ladies with your addresses! If you are looking for the Pro 31 Designs Blog Hop & My Give away, please click on this link!! 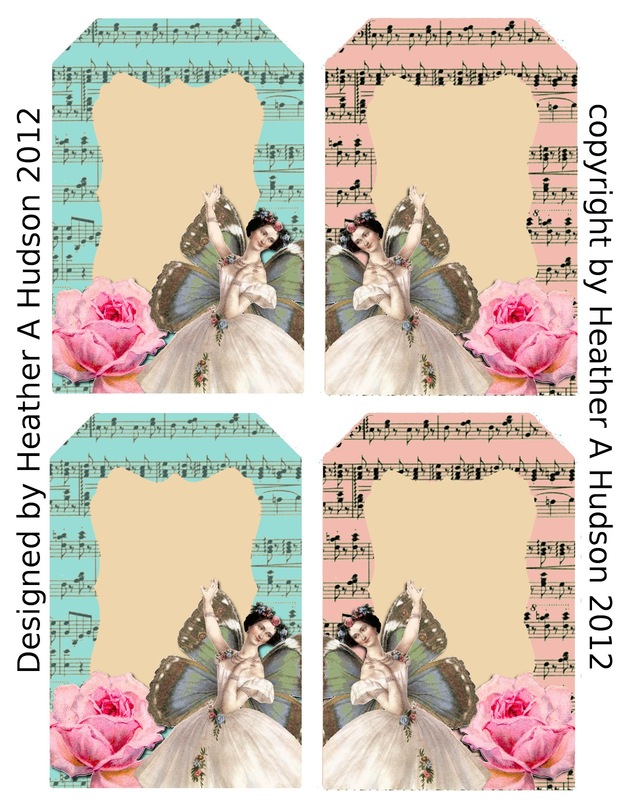 If you didn't know, Pro 31 Designs has a grand prize, each of the DT have a give away as well as a free digital collage tag sheet that I have designed. So please click on the link to give us a visit!! I have a give away on my blog and on my youtube!! Welcome to week 13 "Father's Day"
I have created one of 4 Father's Day cards that I need to make. I thought I would start out on my Brother's card. He is an Awesome Father!! Gecko Galz is having a sale this month!! I used one of this month's Ephemera sets from Gecko Galz. "Man O Man" I also used the "flying Pig" digital stamp. I used embellishments from Pro 31 Designs to dress my card up, masculine style :0). Black Bling Mesh, Brown Crystal wheat sprays, black chandelier drops and bronze pearls. Of course I had to add just 3 Champagne flatback pearls, since they are my fave!! It says "You are the King of the World," which is not something I would normally say to my brother...LOL. Unless I said, well..."When pigs fly"..LOL. So I have the pigs flying on his card, so he knows I mean it! I also used a Black crystal flower and Rosette in this masculine cluster. I thin the seam binding adds a great touch! Here is a look at the inside. I have a place on the left for my sentiment (not sure what I am writing yet) and left the right side open for some matted photos of my nephews. I was super lucky the other day!! I thought I would stop by my BFF's Scrapbook store for a visit and pick up some "Dude" paper. She was actually on her way out!! She was super sweet and let me get the few things I needed...she is the bestest! Not only did I get this lovely the Graphic paper, but she gave me to old books that I can alter!! Wooo Hooo!! If you live in Michigan, you will want to visit her store for sure! It is located in beautiful downtown Dexter!! Here is a close up of the bling trim, rosette, crystal brown wheat spray and May arts leaf trim! So...why don't you get started on your father's day card (if you haven't already) and come and join the challenge this week at Sugar Creek Hollow! Just make sure that your creation has a Vintage, Primitive or Shabby style to be eligible for prizes and honors! Feel free to stop by the PRO 31 DESIGNS Blog Hop!! Each DT Member has Give Away and free digital collage sheet!! I will be sharing my card with the following linky parties for inspiration. So Please come and Play with me and the Design Teams at these two challenges! We have some fabby inspiration for you!! You are in for a treat today!! 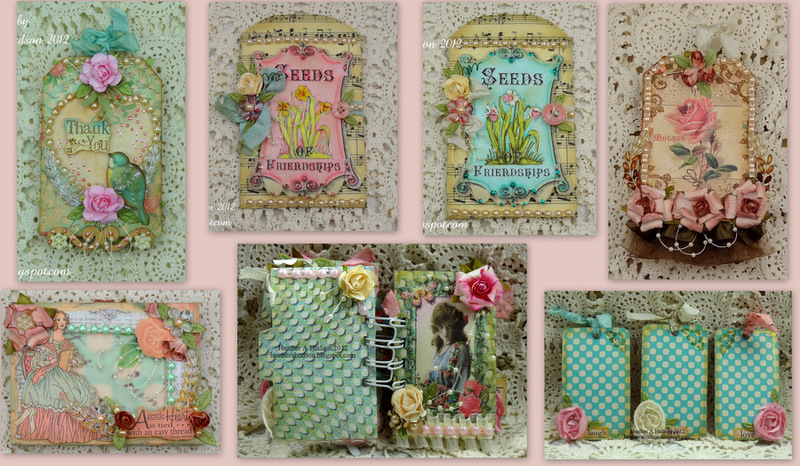 using embellishments from Pro 31 Designs, Vintage Ephemera and Digital papers from Gecko Galz. Digital stamp from Chris Stern. Seam Binding I won from Really Reasonable Ribbon Challenge # 47 (actually I won a $10 gift certificate..yummy)!! See the two gorgeous clear crystal flower beads in the photo below? Well that is really only one flower bead :0). That is when things for my card started to come together. "When life gives you lemons....create some lemonade"...LOL. The one crystal flower was broken in half and I was so bummed!! So I thought, hey..I will just tuck it under some flowers, offset a champagne pearl for the center to make it look "whole." I will be saving my card for when one of my friends is not having such a great day! Hopefully it will cheer them up! Here you can see the fabby Pink and Yellow Blingy Bling mesh that I used from Pro 31 Designs. I used the Pink Mulberry Roses, Champagne pearls, May arts leaf trim, Clear Crystal Flower beads and Crystal wheat sprays all from Pro 31 Designs! All the lemons, glass of lemonade, vintage pin up girl and Fresh Lemonade image are all part of the Gecko Galz June ephemera set "Lemonade". Below you can see the frame digital stamp that I purchased from Chris Stern. I simply changed the ouline of the edges and stripes to pink, and place a Gecko Galz digital paper (lemon squeezy)behind it. I left the center frames black to set off the vintage image. I have created a few collage sheets for the Design Team to give away as a "Thank you" to all of you lovely friends for stopping by and participating in our blog hop! If you need to know how to save a collage sheet and print it out. Here is a video you can watch. Here is my digital collage sheet I am sharing. As a special "Thank You" for playing along with our blog hop, I am giving away a little something for one of my lucky followers that leaves a comment below. Make sure you become a follower and leave a comment below. become a subscriber and leave a comment on this video, and I will do a Second Random draw!! Here is what is in my Give aways (the same but one for youtube and one for here). 1yd of each: Champagne and mint green flatback pearls, Ivory large and small flatback flower beads, small ivory round beads, pink and green seam binding. One each Pink and Ivory large roses. 5 curly mulberry roses, 8 of both pink and Ivory mulberry medium roses, 12 small pink mulberry roses, 5 larger cream rose buds, 5 small bright pink rose buds, 10 of each small green and medium green leaves. A bunch of poofy white flower stamen. Now onto the last and probably the most important step of our blog hop!! Esmeralda's Give away!! before 12 Midnight PST on June 3rd. 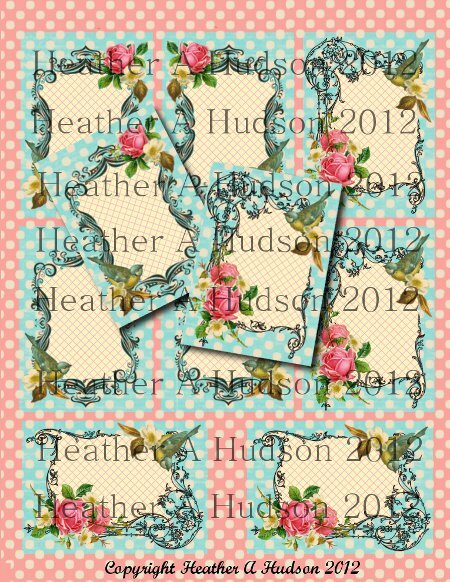 HEATHER10 to get 10% off at the Pro 31 Designs store!! If by chance you arrived at my blog first, here is a list of the Blogs you need to visit. Be sure to leave a comment and become a follower of EACH blog in order to be eligible for the give aways!